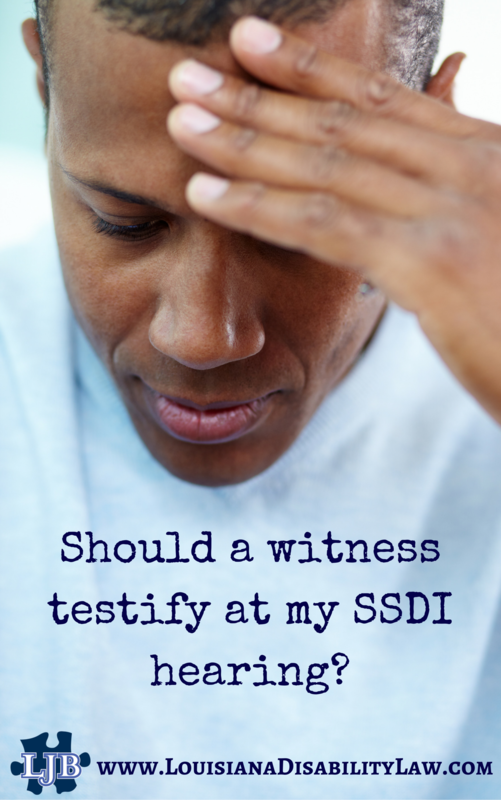 Do I Need A Witness For My Louisiana Disability Hearing? As a Louisiana disability attorney, I am often asked this question by my clients. My usual response is probably not, but this is a case by case determination. In most cases, the medical records are available and provide a good picture of your medical impairments. And, you are usually the best person to relay how your medical impairments impact your daily life and talk about the limitations that you deal with as a result of your impairments. However, in some cases, if either the medical records are not sufficient or if you are unable to adequately explain how you are affected, a witness can be important. A sincere, straightforward person talking about how you are affected by your condition can result in a favorable decision. Witnesses can be a husband/wife, son, daughter, neighbor, friend, co-worker, supervisor, or anyone else that can provide information on the extent of your limitations. When deciding whether or not you should use a witness at your hearing, you need to choose only one or two of the best people to help you present your story. As an attorney, I would never call a witness who I had not at least spoken with in advance of the testimony to see what their impressions are. Your witness can provide testimony that supports your testimony and may add to your testimony. I often find if I ask a spouse to share how their husband or wife is impacted by the disability, the spouse often relays much more difficulty than the claimant, having a different impression of the impact. You need to know before calling a witness whether the witness’s testimony will help your case. If possible, the best witness is someone who an ALJ can view as more objective about your claim as opposed to someone close to you, who is likely to be viewed as less than objective and more willing to help you. Good objective witnesses are more likely co-workers, supervisors, neighbors, social workers, etc. as opposed to family and close friends. Regardless of the witness chosen, the witness should provide observational testimony and not conclusory testimony. What does that mean? An example of observational testimony is, “I have seen Mary return from the store and need to get her son to unload the groceries.” Another example is, “While at work over the past few months, I have noticed John needed to get up from his work station and go lay on the floor for about 20 minutes each morning and each afternoon.” Conclusory testimony is more like, “I know Mary is disabled because I see her come from the store and need help getting inside the house.” The conclusion is that Mary is disabled. Statements like that can hurt a witness’s credibility. If you think a witness may be necessary to help prove your claim, you may need an attorney as well. A Houma disability attorney can help you prepare your case and your witness to give you the best chance of success.